A mixed-used lifestyle complex is being developed on a 1.5-hectare prime property in the urban hub that is Bonifacio Global City (BGC). Shangri-La at The Fort, Manila is thus far the newest and most dynamic property of the Shangri-La Group, which is known not only for its rich heritage of hospitality but for its warm, caring people as well. Located at the corner of 3rd Avenue and 30th Street, Shangri-La at The Fort is rising 250 meters high, with 62 stories, one of the country’s tallest buildings. It is also a LEED (Leadership in Energy and Environmental Design) gold-certified green development, committed to achieving and maintaining the highest standards of sustainable design. 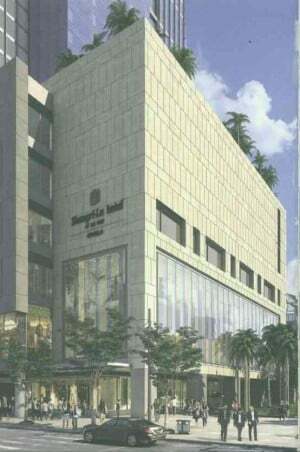 The design architect is Handel Architects; LLP and GF & Partners Architects Co. is the other architect of record. Manny Samson & Associates designs the interiors. The Horizon Homes, a collection of limited highly customized residential units situated on the highest floors, will crown the Shangri-La Hotel. It is a truly unique concept that provides homeowners the opportunity to create their own dwelling spaces according to their individual styles and personalities. Each of the 98 exclusive residences will have luxurious floor-to-ceiling windows with panoramic views of the city and spacious open-plan layout designed to bring family members and friends closer. Horizon Homes residential units will be fitted with white marble countertops and deep walnut veneers. To make cooking at home more enjoyable, there will be two kitchens—one main and the other wet—both fully equipped with branded appliances and modern utensils. providing on each floor only five units: one two-bedroom unit, three three-bedroom units and one four-bedroom unit. Four high-speed elevators will service residents using their own access cards. Household helps can access the service elevators through a biometrics system. Residents will have their private driveway and lobby, separate from the rest of the development. They will also have these private amenities: swimming pool with lounge areas, outdoor barbecue area, private indoor and outdoor dining, as well as entertaining rooms, gym room, male and female changing rooms, and children’s play zone. Horizon Homes residents will be provided with management services by the Shangri-La Hotel, dedicated reception and concierge, and 24-hour security integrated with the hotel security system. They can purchase parking slots at a basement parking level exclusively for them. The mixed-use property features the hotel which has 576 contemporary and spacious guestrooms and suites with unparalleled views of the city and the bay. The minimum room size is 45 sqm. Also featured in the entire lifestyle complex are the Kerry Sports Center and a retail arcade where shoppers can experience a fashion forward feel. Kerry Sports Manila offers an NBA-grade indoor basketball court, two tennis courts, two squash courts, an indoor lap pool with an entertainment and dining area, extensive gym facilities, exercise studios and a wellness spa with nine treatment rooms. With such fitness facilities occupying 8,000 sqm in two dedicated floors, it will be the most comprehensive indoor lifestyle and recreation destination in BGC. Also to be housed in the complex is Adventure Zone, a multilevel indoor playground for children with activities for three age levels and four rooms for children’s parties. Within the mixed-use complex is the Shangri-La Residences featuring 97 one-, two- and three-bedroom homes, measuring between 90 and 239 sqm. Each residence is fitted with a kitchenette, a living room/dining area, a walk-in wardrobe and modern amenities. Event spaces at Shangri-La at The Fort can suit any occasion. For instance, the pillarless Grand Ballroom, measuring 1,800 sqm., can accommodate up to 1,800 guests. There’s also the Bonifacio Hall, a junior ballroom measuring 780 sqm that can accommodate up to 715 guests. Also available are 19 multifunction rooms located on the hotel’s multiple floors that can address any event needs. High Street Café is a modern-day marketplace concept with nine kitchens featuring daily international dishes cooked according to one’s preference. High Street Lounge, adjacent to the café, serves a wide selection of teas and beverages in a refined modern setting overlooking BGC’s High Street. Canton Road offers Cantonese and Huaiyang cuisine. Raging Bull Chophouse & Bar offers dry-aged steaks and western grill items. Samba Poolside offers a collection of South American dishes by the pool. Limitless is an entertainment club that features extensive mixes of artisan cocktails, trendy music and private VIP suites. Raging Bull Burgers is a shop serving the finest handmade burgers for diners on the go. The project is a joint venture between Shangri-La Asia Ltd. and Shang Properties Inc., the property development arm of the Kuok Group in the Philippines. Its soft opening is expected this yearend. At the helm of the soon-to-open Shangri-La at The Fort is GM John Rice. Prior to his appointment about five months ago, he was area general manager at China World Hotel, Beijing (Shangri-La Hotels and Resorts). Rice is no stranger to the Philippines, this post being his second. He was GM at Edsa Shangri-La Manila for one year and six months. Looking forward to one of the most anticipated property openings in the hotel group, Rice will uphold the same standards of hospitality and service from the heart that guests have come to expect from Shangri-La hotels and resorts all over the world.